Autoload- Jack up version is developed for the specific need for monitoring and simulation of stability and strength both for free floating (transit) -condition as well as jacking up / preloading and Elevated- conditions. The Screen interface is designed to give the operator a full overview of the vessels status in all operation modes, both free floating and jacked up. In free floating mode leg positions (height) can be set individually for each leg graphically or numerically. Buoyancy, vertical center of gravity and wind area due to changes leg height positions will immediacy update with change of leg position. In Jacking and Elevated mode, the vessel is no longer free floating. A “Jack up window” is developed to monitor and simulate all relevant aspects related to the specific need for operating the vessel in these modes. Jack up Screen interface, Elevated mode. Autoload 3D-viewer. Graphical 3D presentation of crane operation and deck load. Weight crane and hooked load, wire and buoyancy are accounted for during the crane lift. Monitoring of vessel cog and tipping moment with alarm when exceeded. Crane online or simulation (planning). Handle intact and damage conditions. Handle wind in any direction (360 degrees). Compare vessel condition with preset strength and stability limits. 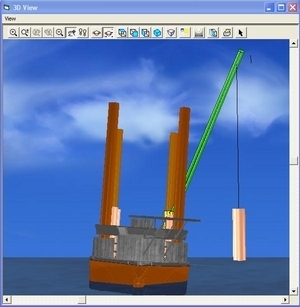 Simulate crane loading and unloading with 3D crane model. Calculate weight of wire paid out, buoyancy from submerged cargo. Graphical editing of deck cargo. Cargo manifest report with graphical layout of deckload. User controlled Library for standardized deck cargo. Graphically pipe loading with water in pipe calculations. Perform crane ballast sequence, or any other sequence. 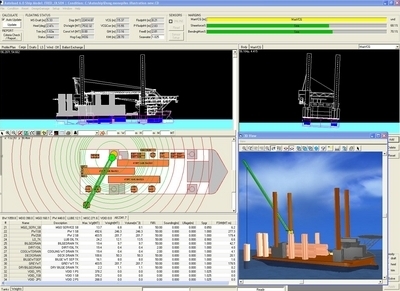 3D window showing vessel with correct deck load, crane position / load and vessel floating position. Automatically or manual Draft survey, based on draft sensors input or manually observed drafts at marks (draft marks and draft sensor positions included in 3D vessel model ensure accurate calculation, also if vessel is not upright). 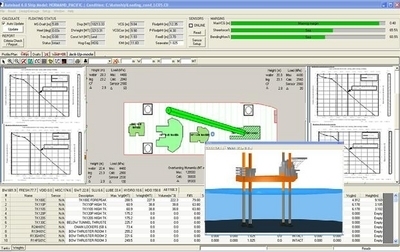 One license of Autoload for a specific rig can be installed on unlimited number of computers onboard and onshore, with exchange of loading data (for emergency response and redundancy) with no extra cost. Individual leg penetration curves saved for each field. Monitoring of online load / penetration during the preloading phase. Load / save / report / print penetration curves. Max allowable load (set for each field). Alarm for max allowable Spud can load. Calculate Overturning moment and check against Max allowable tipping moment. Sea Depth independently for each leg. Calculate constant (unknown) weight based on measured leg loads. Autoload can either be fully integrated into the vessel control system or receive sensor data via standardized communication protocols, for tank loads, draft, mooring loads, chain paid out, (chain in lockers), risers, wind or any vessel load measured with sensors. When on-line, all sensor data are automatically updated to reflect real conditions. Or operator can choose to work off-line to carry out simulations (what if situations). Autoship software was the first true marine Windows application back in 1990. Today Autoload remains a true windows application, designed with the latest available tools for graphical interface and reporting, Autoload can be installed on any computer using the Windows platform.